Grandparents are awesome. Most are happy to help out, they love spending time with their grandkids and the bond between grandparent and grandchild can be really special. It’s beautiful to see. However, as useful and as treasured as they are, sometimes they can do things that you just don’t agree with. The trouble is, parenting styles have come a long way over the years, but to grandparents some of the modern techniques seem pointless and unnecessary. When grandparents don’t respect the parent’s wishes, this can lead to a number of issues when parents discover different rules have been introduced at grandma and grandpas house than they are at home. The trouble is, it can be difficult to challenge the behavior; especially if the grandparents help out a lot with the children. Many parents also feel like it makes them seem ungrateful if they speak up about something they’re not happy with. However, what you need to realize is that as a parent, you can absolutely set boundaries with grandparents, and doing so doesn’t make you ungrateful. So, how exactly do you set boundaries with grandparents? Below, you’ll discover some great tips and advice which can help. One of the biggest mistakes you can make is to hold in how you feel. Sure, you don’t want to cause tension and you may feel uncomfortable saying how you feel, but you know what’s going to happen if you bottle it up? One day, maybe weeks, months or even a year from now, you may end up having a full-blown meltdown over something really small. Never wait until you’re just about ready to explode. Sit down and tell them how you feel. You might be surprised to find they have no idea they were making you feel that way and the behavior might automatically stop there. Of course, it might not, but then you can move onto tip number two – ensuring grandparents know the child’s routine. Sometimes, grandparents do things differently because they have no idea what the child’s normal routine is. You might have even mentioned something in passing, such as “I’m heading off now, I usually give a bottle at around noon”. However, these kinds of things are easy to forget when you’re looking after a baby or toddler! So, to ensure the grandparents know exactly what you expect, sit down and talk about your little one’s routine. Write it down so it’s easy to refer back to. Include the basics such as nap times, mealtimes and anything in particular you don’t want the child to do while you’re away. That way, they know what is expected and more often than not, they’ll try to stick to it. While you obviously want some rules and boundaries to be kept, try not to be too strict. After all, it’s normal for children to do things slightly differently at their grandparent’s house. It’s one of the best parts of the grandparent and grandchild relationship that they do special things together that they wouldn’t get to do at home. It could be they enjoy a little more chocolate at grandma’s house. These treats are something to be treasured and won’t usually impact how the child behaves at home (of course if it does, please don’t hesitate to speak up about it.) Accept that the grandparents are likely to do things a little differently and that’s OK. As long as it isn’t causing serious problems at home, allow for a little flexibility sometimes. Sometimes, the constant suggestions and tips grandparents give us can start to feel a lot like judgement and criticism. However, most grandparents aren’t actually trying to make you feel bad. They genuinely want to be helpful and feel their years of wisdom could benefit you. So, instead of instantly getting defensive, try to remind yourself that they do mean well, even if it doesn’t necessarily come across that way. If you’ve made the boundaries clear but they’re still being crossed, it’s time to handle it tactfully. It’s surprisingly simple to do this. Take for example, the grandparent who keeps allowing the child to do something you don’t want them to do. Tell them you understand they don’t see things the same way you do and they have a different approach, but you’d really appreciate it if they would follow the way you do things. Or perhaps they keep giving you advice you don’t really want? In this situation, you can let them know that you appreciate them sharing their expertise, and you’ll let them know if you need any help. In both of these examples, you can clearly see that the key to handling both of them is to let the grandparent know you appreciate them. You aren’t just dismissing what has been said and that in itself can really help to diffuse and resolve the situation. You can also invite them to come along to pediatrician appointments or parenting classes so they can see just how much things have changed. Helping them to understand more modern methods can be really beneficial. There’s going to be times you just want to give up trying to get your point across and have your boundaries respected. However, it’s important you keep trying to make it work. Persistence does pay off and you need to think about the children. Children need their grandparents and vice versa. It’s one of the strongest and most important bonds they will ever develop. The relationship between grandparent and grandchild lasts well into adulthood. So, as hard as it sometimes may be, you need to commit to making it work. Overall, it can be difficult trying to set boundaries with grandparents. It’s important to ensure they know you appreciate, respect and love them, but the parenting decisions are yours. All grandparents really want is to feel needed, so look at ways you can include them without compromising your own parenting beliefs and methods. I think that almost every parent can relate to this post! We have all dealt with our parents becoming grandparents for the first time and over spoiling their first grandchildren. I didn’t really have many problems with my father since he is a very relaxed grandfather to my boy – he doesn’t really do anything that I say not to. But on the other hand, my mother often tries sneakily giving my boy some candies even though I tell her that he isn’t allowed to eat sugar towards the evening or it makes him too hyper. I found her breaking this rule at least twice, haha. I understand that she’s a grandmother and just trying her best to ”bond” and connect more with her grandchild but I don’t think that breaking the rules that we’ve set our child is the right way. However, we never really argued over it. We all discuss things very calmly. That’s really thoughtful of you, Jane, to have to talk about limitations when it comes to your kid in a calm way. I do think it’s unbecoming to argue with our parents regarding any matter if they are not bad role models at all. Things are always discussed best when everyone is calm, and not engaged in a shouting match. It’s also a good way to teach your children about good manners and respect for people. I am a senior and this generation behaves in a queer way when it comes to their kids. I get the feeling their kids will never get to enjoy that bit of pampering grandparents feel is their privilege to indulge in. .
Hell will not break loose if with a bit of adjustment grandparents could have some space there. I certainly do not endorse dominating grandparents taking over. I guess I am slightly different in that I am a grandparent with custody of my granddaughter so I am the one that sets the boundaries for other people. It has been difficult over the years (she is now 10) as her parents were both very bad role models and although the courts stipulated they should have contact with her, I found it really hard to tolerate some of the things they did when around her. It’s easier these days as she is beginning to see that some of the things they do are wrong. I would love to be a normal grandparent and I hope that one day I will as my daughter hopes to have children in the future but I shall bear in mind that I am not her mother and will abide by my daughter’s wishes. I remember when I was little my grandmother took me to the hairdresser and had all my curls cut off. My mother was mortified! I know I would never do anything like that without permission! You had me laughing there, Linda, about your mother becoming mortified upon seeing your curls gone, haha. I could just imagine the look on her face. Yes, matters like haircuts should be left to the child’s parents. Glad to know you are someone who knows the limitations of her role regarding child-rearing. Most grandparents only want the best for their grandchildren, which sometimes spoil the kids. Still, a lot knows how to distance themselves regarding sensitive matters involving kids. I think it also depends on the type of relationship you have with your parents. With me, I am very close to my mum and I tell her everything and she knows whatever I say, I say only with concern or the fact that I didn’t understand. When my mum helped care for my first child, baby bath time came and my mum held her upside down for her first bath. I was terrified! I told her how I felt immediately and she explained it was only for the first bath and it helps with circulation and all that. She wasnt upset, she understood how I felt. On the other hand, if you don’t have a great relationship with say your mum or dad and you want to express how you feel about them helping out or things you don’t understand, you have to do this tact and pick your words very carefully. This will help everyone at the end and may even improve strained relationships. You’re right there, joegirl. If one is close to his/her parents, they could say what’s on their mind without offending them. You’re lucky to have a wonderful relationship with them. That is priceless! And yes, it is important to consult parents, especially first time moms, because they are still learning the “tricks of the trade” so to speak, and the parents are the best source of how-to information. Just like the last poster said, it depends on the king of relationship you have with your parents. I have seen people whose relationship with their parents is nothing to write home about. In such a situation, they try as possible to set boundaries between their children and their grandparents. Fear and lack of trust could be few reasons why such happen. Grandparents are understood to be wiser as they age. They’ve seen it all and know areas where they could be of help. Single parents most at times, often leave their child/children with their parents while they are away working to provide and support their family. For me, i have a very good and admirable relationship with my parents. All thanks to their good upbringing. With this is mind, i believe they will also want the best for my wife and children. All things being equal however, as a parent, you have the final say regarding how you want your children to be treated. Do what feels right to give your family a secured future. I can so relate to this.grandparents they don’t just know when to stop. they can pamper their grandkids to a fault but they forget we (their children) turn out well because they disciplined us. I have learnt from this, will follow this route diligently. Oh well, I guess most grandparents, indeed, do not know when to stop. But I guess for some, they really just mean well and are just happy to be taking care of their grandchildren, however, it does tend to spoil the kids. And this becomes a dilemma for us because the child might see us as an antagonist, especially if we say ‘No’ to things that grandpa or grandpa said “Yes’ to. I’m sure there would be ways to lovingly tell them that their love and care for our child might spoil him/her. Sadly I have not had much opportunity to do any grandparenting. Most of my grandkids were not where I could reach them and spend time with them. However, the one where I did get an opportunity to enjoy, neither parent – mother or father – had to tell me “their rules”. I think perhaps me having had 11 children of my own, they didn’t think I needed any advice. I don’t know! On the other hand, my mother-in-law? Yikes!! She and my husband butted heads over child-rearing methods. Ouch! In the end, though my husband had to be very firm and not budge about the way things were going to in his house, she bent her will to his will and we all started to get along! Just as things were working out (I thought), she left and went back home. Well, I know when the day comes that I become a grandma, I would want to put in my two cents about how my kids should raise their own children. But as you did say, when you and your husband were the ones raising your kids, he was very firm about how he wants things done in his house, so I’m sure you would understand how your son or daughter feels now that they’re raising their own. Currently, my wife is living with her parents. Her mother takes care of our three months baby. My wife and I do not agree with some of the parenting techniques of the grandma, however, we don’t voice our concern. We know she means no harm to the baby and she is doing her best. Sometimes, we tell what we want for the baby and the grandma agrees. Soon, my wife will come to live with me in my parents’ house. Since we are working parents, my mother will have to look after the baby when we are away. We may not agree with her parenting style, however, we will have to trust her. She is more experienced than us. She brought four children and her children have themselves become parents. The grandparents know best even if we may disagree with their parenting styles. It is true that nursing mothers get to understand how to relate well with their mothers when they visit and helping to take care of the kids. I have seen issues that arose between a nursing mom and the grandparents and it is not always good to experience. You really gave great tips on how such issues could be sorted out without having a clash. I’m enjoying reading your articles every day for I always learn a lot. Keep up the good work. As for my daughter’s Grandparents on my side. I don’t need to set any kind of boundaries since I have seen how I and my sister were brought up by them. So I know where we lack at something when it comes to raising kids. Though sometimes they spoil them, we just tell them to limit what they give. And with my fiancee’s side most often they ask if it is okay or not before they do what they want. This methods are friendly and will help in setting boundaries without hurting anyone. Grandparents can be critic sometimes and might want you to raise your child the way they raised you. I think the timing can also help. This means leaving the children at their grandparents house for few hours and not until a week so as to prevent them from learning new unwanted habits. Discussing routines can be very effective and trying some routines suggested by the grandparent can also be nice since it will make them feel that they are respected. I will make sure to apply the methods mentioned in this post when I ever need to set boundaries with relatives. Sometimes grandparents aren’t great roll models and the tips above just need to be overlooked. 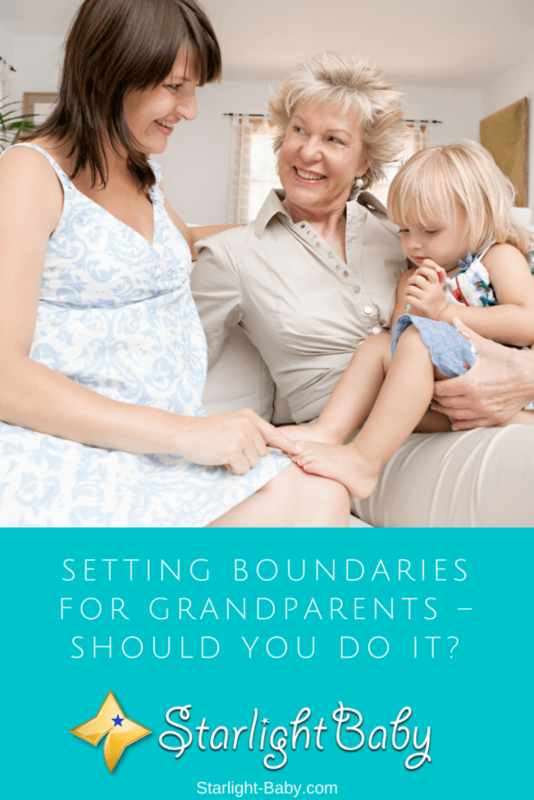 There are some extreme cases in which the grandparent needs strict boundaries. And if those boundaries are continuously overlooked and over-stepped, the relationship needs to be looked at further. I understand this would be in a very extreme situation, and that everyone should be given a chance. But there are some situations that, in the best interest of the child, the grandparent/grandchild relationship must be monitored closely and in some cases stopped altogether. Personally I am part of one of those situations where the relationship between my mother in law (who is an expert alcoholic) and my son (who is now 15 and able to see a little for himself now) needs to be monitored closely. She used to pick him up drunk, take him shopping drunk, etc. while she was driving! Of course I wasn’t aware of the situation at the times she was doing it or of course it would have been stopped immediately. Just a side note that there are exceptions when to continue working on it, just doesn’t work unfortunately. Happily, this is not an occasion that everyone has to deal with and the advice in the article would definitely work otherwise. Thankfully my own mother has backed off when I felt her advice was just too much sometimes. And although we have our squabbles, the relationship between her and my children has always thrived and flourished. I can put restrictions on my parents with the kids, maybe is the way life works as I don’t want to go into full details on it, I didn’t see much of my parents when I was growing up of was my grandparents who took care of me. Now I am wondering how you placing boundaries will make them feel, it won’t go down well to start with, and there will be a whole lot of fights even though some can’t tell. Placing restrictions on grandparents will break their heart no matter what, they don’t have much time to stick around that long, I really don’t go well with this article this shouldn’t even be a subject of discourse. Grandparents are and still will be in our memory no matter how disgusting, annoying they can be at times, it is still not right to place boundaries because they have existed long before we came into their lives. My wife and I both are working. We have one-year-old baby. Our parents were very helpful in helping us raise the baby. They not only helped us with advice, bit also looked after the baby when my wife and I both went for work. Generally speaking, children who spent most of their times with their grand parents are spoiled. Because of age and out of love, grandparents cannot become strick with their grand children. Since children exercise absolute freedom with their grandparents they become undisciplined. I always ask my mother to be strick on my child, however, she makes fun of me by asking the child to hit me.